I was recently asked by a young reader to visit his blog and offer comments on his art. I encouraged him and let him know that he ought not ever be discouraged because of criticism or rejection. The reality is that, in this business, one can expect rejection over 90% of the time, so it’s nothing with which an artist should concern himself. I had to point out that getting work is like fishing; there are a countless number of fish in the sea, and out of all those you’re only likely to catch a handful. Those handful, however, make for good eatin’, so it’s worth plugging ahead. 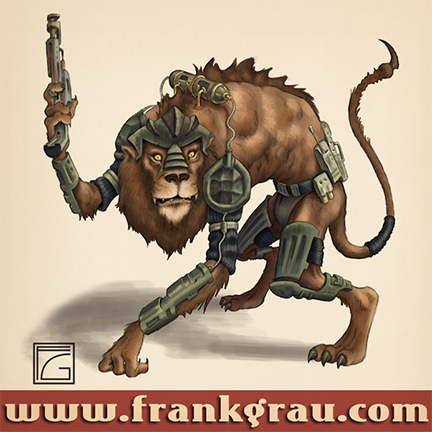 The following is a design which was rejected because, while the client originally had asked for an alien creature with a lion’s head, he later changed his mind and asked for something different. I’m no prima donna, so I happily followed my marching orders. In my mind, the client should get what he wants (within reason), and it’s my job to revise things accordingly until the customer is happy. In any case, rejection shouldn’t be taken personally. It’s all part of the job, and anyone wanting to do art professionally ought to have the thick skin to handle criticism and rejection. I designed an awful lot of characters for the Cozmo’s Day Off iOS app, by Ayars Animation. This particular character is on page four (I think), and it only appears for a brief moment on the dashboard screen of Cozmo’s space ship.